Some people like drinking from water bottles with a straw. If you are one of them, then you’ve come to the right place because we’ve reviewed some of the best insulated water bottles with straw in the market. Drinking from a straw also has advantages and you can use these bottles anywhere. Just like insulated water bottles, these also keep water cold for a long time but with the addition of the straw. So, you get to enjoy a cold drink with the ease of sipping. Additionally, the material of these bottles is very sturdy, so you’ll be using it for a long time. Just make sure to take care of it properly and clean it thoroughly so that you get the most out of your purchase. The best insulated water bottle with a straw that we can find is the 3 in 1 WAV Bottle. This water bottle is a vacuum insulated stainless steel bottle that comes with 3 different kinds of lids – straw lid, flex cap, and screw cap. You can choose between them and easily swap depending on what type of drink you have. This is a great bottle that can be used for all ages and available in 40 oz, 32 oz or 24 oz size. This is a water bottle that keeps water cold for 24 hours or hot for up to 6 hours because of its vacuum insulated feature. Since the bottle is stainless steel, it doesn’t break easily unlike glass water bottles. It also retains the temperature longer and is BPA-free unlike other plastic water bottles. The only downside we found is that the bottle may easily dent when dropped. Therefore, it’s a good idea to put on a protection like a silicon sleeve to absorb impact upon fall. Despite that, it still does its function properly and works great because it was engineered to keep your drink’s temperature. Additionally, the bottle’s wide opening makes it very easy to add ice or effortlessly refill with water, minimizing spills and messes. Many users love this water bottle and purchasing this comes with a 100% hassle free money back guarantee if you are not satisfied. 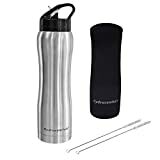 This is the best insulated stainless steel water bottle with a straw because of many positive reviews from users. Overall, we can say that this bottle is a great buy and worth the money. At first look, the Hydracentials 25 oz bottle is very simple, bearing only its name at the bottom of the bottle. It has a triple layer of insulation in addition to the double wall vacuum design, so it keeps your drinks cold for a longer period. This bottle is sweat proof and condensation free so you don’t have to worry about excess water outside the bottle that leaves water marks on surfaces. The stainless steel used in this bottle is 18/8 food grade which makes it very durable, BPA-free, and safe for your health because it won’t leach harmful chemicals into your drink. The bottle has a flip spout and straw drinking mechanism that makes drinking easier while on the go. The flip up top makes single-handed drinking possible so this is ideal for busy people that always have their hands full. Hot liquids are not recommended for this bottle because drinking hot liquid from the straw can burn your lips and tongue. The bottle has a handle which makes it easy to carry and attach to bags or backpacks. This easily fits most cup holders, so this is a bottle which you really can bring anywhere with you. The Hydracentials is our second best water bottle with a straw brand on our list. 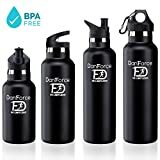 DanForce is another best water bottle brand on our list. It also has a very sleek and simple design. The durable bottle is made of a double wall vacuum insulated stainless steel 304 strength that can keep hot or cold water or drinks. However, it’s advised not to drinks hot water straight from the bottle as it can burn your mouth. Best is to pour the drink into a cup to safely consume it. The bottle is BPA-free and is non-toxic so it is safe to drink from and doesn’t leave a chemical taste in your water. This bottle has 3 lids to choose from so you can customize your bottle depending on your needs. There’s a sports cap lid, a hot lid and a daily straw lid. There is one comment from a user that says the straw and the sport top makes too much noise when drinking. Otherwise, it doesn’t affect their function and still works great as it is intended to be. This water bottle also available in 4 different size range from 12 – 24 oz. So, if you are regularly hitting the gym, the smaller size is one of the best water bottles for the gym without you needing to lug a big bottle to add weight. This DanForce bottle is fully functional and a wonderful bottle to have with its reasonable price. It is an ergonomically designed water bottle which makes it easy to grip and use. It is the ideal water bottle size, plus the 3 lid options, especially the straw, are great features that can make hydrating easier. Another bottle with a simple design is BlissActive insulated water bottle. It’s made with a premium quality double wall design that can keep water cold for at least 20 hours and prevent ice cube melt easily. It effectively prevents condensation and has a silicon base, so you have a bottle that is sweat-free and won’t slip easily. The bottle is made of very durable food grade 18/8 stainless steel that is BPA-free and chemical free, keeping your drinking water safe. It has a secure screw cap which prevents leaks, so you stay away from spills and mess. This bottle is dishwasher safe making it easy to clean this bottle without much effort. One notable drawback of this bottle is that the straw is not covered and that can be a hygiene concern. But some also say that the straw can be tight to open, so it’s effective in keeping your bottle free from leaks. Overall, this is a great bottle for a great price. The bottle has a very attractive design and does its job pretty well. It has a great shape that fits most cup holders and is ergonomically designed for a nice grip which makes it ideal if you are always on the go. Also, the straw is easy to handle for both kids and adults, so this bottle is very usable. The Contigo Autospout 20 oz water bottle is smartly and ergonomically designed for an easy grip and one-handed drinking. The bottle can keep your drink cold for 12 up to 18 hours with the Thermalock Vacuum Insulation, and Contigo says the bottle can keep it cold no matter what. The bottle has a pop-up straw on its autospout lid, making it easy to drink and the one-touch operation makes it even easier. The spout has a protective cover that keeps out dirt and germs from building up on the straw. The bottle is BPA free and is dishwasher safe for clean drinks and easy handling. Hot liquids are also not advisable for this water bottle as it can create internal pressure when covered and that can make the contents burst out and spill when open. Only cold drinks are recommended for this bottle so that you can enjoy its features well, with the exception of carbonated and pulpy beverages. This Contigo bottle is a uniquely designed insulated water bottle with a straw that is very sturdy and light to carry. It also fits most car cup holders and it has a handle which makes it easy to transport. You’ll never go wrong with its one-handed drinking design and the straw makes it even easier to take in water. The GO Active Insulated Water Bottle has so many colors to choose from, and looks ideal for active people with its vibrancy. The bottle is also made of 304-grade stainless steel which makes it durable and long-lasting, great for outdoor activities and even daily use. The bottle’s exterior has a no-slip solid grip feature that stays in your hand despite sweaty hands. It helps you in preventing the bottle from slipping from your hands – less spills and less waste! The bottle has an easy-carry handle that makes the bottle convenient and easy to grab. You can also attach it to your bag. The straw is also exposed and doesn’t have a protective cover. While the bottle doesn’t have lid to cover the straw but it can be folded so its inner opening can be sealed off. The straw’s design makes it easy and enjoyable to drink from, encouraging you to drink more and stay hydrated throughout the day. The GO Active bottle is lovely, simple, and light which makes it an excellent bottle for daily use and not just for sports activities. The bottle can keep your water ice cold 24 hours, giving you access to chilled water longer which similar to The Coldest Water Bottle brand but without a straw. 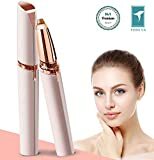 We go through hundreds of products listing at Amazon and also study the ratings left by previous buyers to find the best insulated water bottle with straw for you. Besides that, we also calculate the overall net ﻿﻿﻿customer satisfaction (NCS) grade because we want to see how happy is the previous buyers with their purchase of the product. From our finding, we can say that WAV Bottle, Hydracentials and DanForce are the best insulated water bottle with straw brands. These brands are popular and received many excellent ratings for their products. Also, the 3 in 1 WAV Bottle, Hydracentials Water Bottle and DanForce Water Bottle score favorably for the ratings as well as the NCS grade compare to the rest. We believe that you would find these insulated water bottle with straw a good buy too. There are a lot of other bottles to choose from, but not all have straws. So here are some reasons to pick an insulated water bottle with straw over a regular bottle. These are a reusable water bottle, therefore, environmentally friendly. You eliminate the use of single use bottles and straws. Cleaning your water bottle is very easy. You only need warm water, a little soap, some scrub with a bottle brush or sponge, and rinse it thoroughly to remove all the residue. You can also check your bottle’s manual to know if it is dishwasher safe. This saves more time in cleaning and adds more sanitizing. Cleaning the straw is a bit similar to washing the bottle. There are pipe cleaners available for the size of the straws. Use that with some dish soap and make sure you clean the straw all the way through to avoid molds from building up. Straws are prone to bacteria if not well cleaned, so the best way to prevent that is to brush it properly. Depending on your activity, different bottle has its own usage. For example, collapsible water bottles are good for traveling in lightweight and bottle with straw is excellent for general use. So, we hope that the above reviews have given you some useful information and helped you to decide which water bottle works best for you. Using a bottle with a straw has great benefits but it’s important to ensure that your bottle is always washed and cleaned after every use to prevent bacteria and mold from forming especially at the straw area. So, there you have it. We hope that this post is helpful and let us know which is the best insulated water bottle with straw you have selected by commenting it below.